Need more information about booking Home 8606379 ? TAKE ADVANTAGE OF OUR 10% OFF SPECIAL OFFER FOR STAYS IN AUGUST 2018! 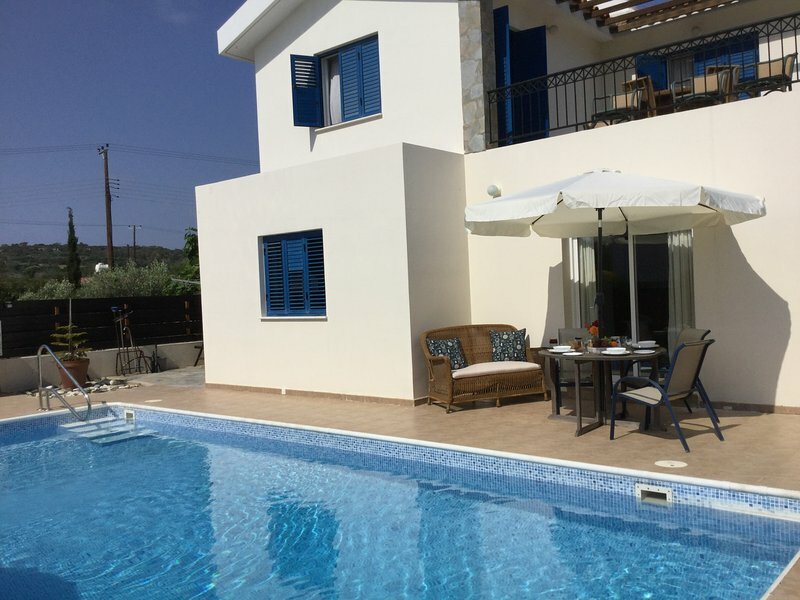 Villa Antheia is a beautiful 3 bedroom villa, 8 minutes walk from the nearest beach and 15-20 minutes walk from the Protaras strip (main resort with shops, restaurants, bars) and Fig Tree Bay. Other local supermarkets, restaurants and a bus stop are 5 minutes walk. The villa offers a private swimming pool with a sun terrace and free WIFI. This area of Protaras is a favourite for visitors, as the Villa's location attracts a countryside outlook and is close enough to the beach and town to enjoy the best of both worlds. The villa is spread over two levels and all bedrooms have air conditioning. Ground Floor – suitable for older guests or those unable to climb stairs. - One twin bedroom with good wardrobe space and shutters on windows - Toilet and shower room. - The living areas are open plan and include two comfortable sofas and two chairs, a TV, DVD player and ceiling fans. - The kitchen is fully equipped and there is a dining area for 6 people, although there is room to add more chairs. - Master bedroom with kingsize bed and pull out single bed. Good wardrobe space and sliding doors onto the large upstairs balcony. - Second bedroom with kingsize bed and good wardrobe space. Sliding doors onto the large upstairs balcony. - Family bathroom, including shower in bath. Fresh linen is provided and bath and beach towels are available for all. Guests can access the private swimming pool and garden area through the sliding doors in the living room. There is another terrace to the side of the property with an outside eating area which is also accessed through another set of sliding doors. Villa Antheia has a BBQ, terrace and sunbeds for your use. The property offers parking. Cots, highchairs and other baby equipment are available to rent at a small fee. Larnaca International Airport is located approximately 45 minutes drive away. The villa is approximately 1.5 miles from one of the must see beaches in Cyprus, Konnos beach. Watersports are available here and on other nearby beaches. The villa and it's location is great for families and couples. A car is not needed as you can reach most places by foot and there is a bus stop a few minutes walk from the villa. Taxis are also reasonably priced if you want to give your legs a rest. A car is recommended if you want to explore! All enquiries will be responded to quickly and efficiently prior and during your stay. We want to ensure you have a great holiday so can suggest activities and recommend places to visit and to eat. Firstly ensure you have a great time! Earlier and later check-in can be arranged depending on availability. Glass and china ware not to be used in pool area. There are significant costs involved if broken pieces get in the pool as it will need to be drained. Towels are for villa use only and not to be taken to the beach. No washing up is to be left upon departure. We understand breakages occur, but please ensure all are reported.